This devilish diva likes it Hot! 5 piece costume includes horns, off the shoulder dress, tail, vinyl waist cincher and pitch fork. No bones about it, she will make you come alive in this 3 piece costume that includes hair pin, jumpsuit and gloves. Glow in the dark. 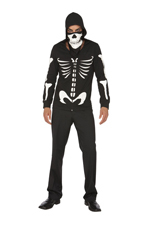 Scaring up a good time in this 2 piece costume that includes zip front hoodie and bandana. Glow in the dark. She's an expert with a long hose in this 3 piece costume that includes hat, dress and belt with attached suspenders. She likes a lively bucking bronco in this 7 piece costume that includes cowgirl hat, neck piece, dress, vest, belt, holster and gloves. She's a vixen with a badge in this 4 piece costume that includes skirt, top, neck scarf and hat. #9279. This sheriff is packin in this 6 piece costume that includes dress, waist cincher, belt, arm bands, lariat and hat. #9069.